They told us the approach would be hell this late in the season. It was, but we’ll never admit it. We parked at the gate to White Salmon Lodge, left the car at 4am and walked the road past the lodge to the base of Chair 8. There was plenty of snow. Material online and on paper described two ways forward from here. 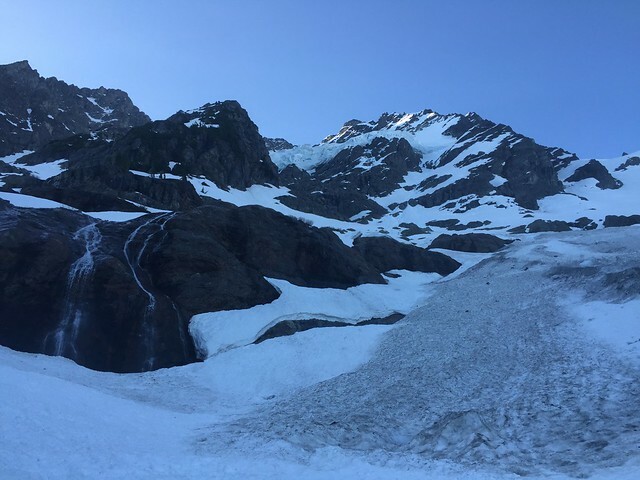 The first has you traverse along Shuksan Arm, maintain elevation where you can and generally avoid the dense brush in the valley. The second has you drop immediately from Chair 8 through an old clear cut to the valley floor. 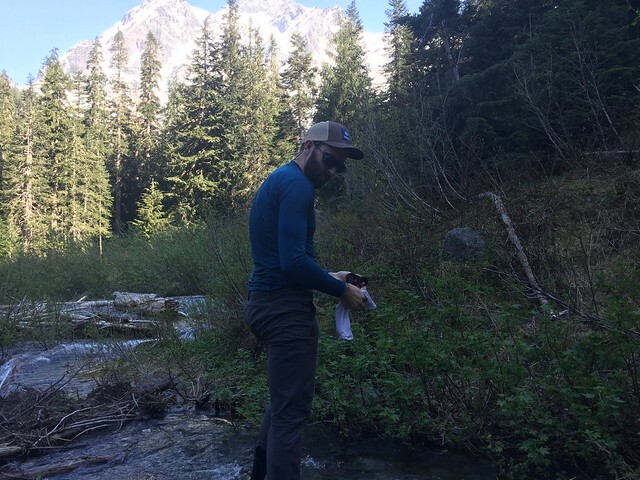 We went with option one and found a suitable place to cross the first (of many creeks) several hundred feet upstream. In general, our route from here maintained elevation along the Arm. We did a fine job, but sloppy snow, cliff bands and creeks made progress relatively slow. This approach worked well, though would have been better with more snow. We felt smug as hell on the open slopes below Shuksan. Where was all the alder we’d been warned about? Naysayers be damned! With plenty of light, and a clear view of the saddle below the NF, we picked up the pace of travel. The debris field beneath the Hanging Glacier impresses the power of the mountain upon the observer. Don’t mess around. We trended climber’s right and wrapped up and around a large rock outcropping in the path to the saddle. In retrospect, trending climber’s left might have been more efficient, especially with more coverage. The snow surface was variable. Frozen and hard in some places, and soft in others. Wet skins and loose corn eventually brought us to the saddle. 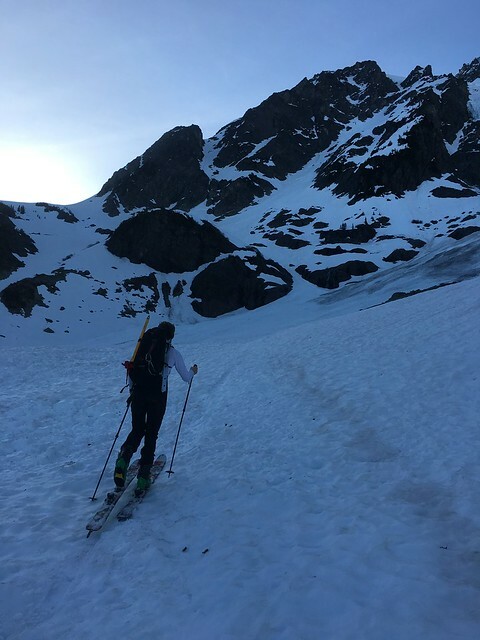 We had a quick snack, donned harness and threw skis on our packs. We were roughly an hour behind schedule, but decided to push out toward the face. This section has a lot of exposure. Cliffs rise to your right, and Price Lake is visible several thousand feet below. The slope isn’t that steep but it left me on edge. At this point, we were pretty concerned with the quality of the snow. It was wet and soft to a depth of 10-15 inches. Even though this section had received sun for several hours, it was clear it hadn’t frozen the night before. As boots displaced snow, we kept a very close eye on the progress of rollers down slope. They didn’t entrain other snow, generally broke up a dozen feet below us. We proceeded with caution into the hot sun. Tim and I took stock of the line, and the terrain we just crossed. We acknowledged that we didn’t want to retreat along the traverse later in the day given continued solar affects. We committed to topping out. The first 500 feet had some large cracks. We navigated them without too much trouble and avoided the main runnel that runs down the face wherever possible. One can see exposed rock above, and the lines written by releases of yesterday. 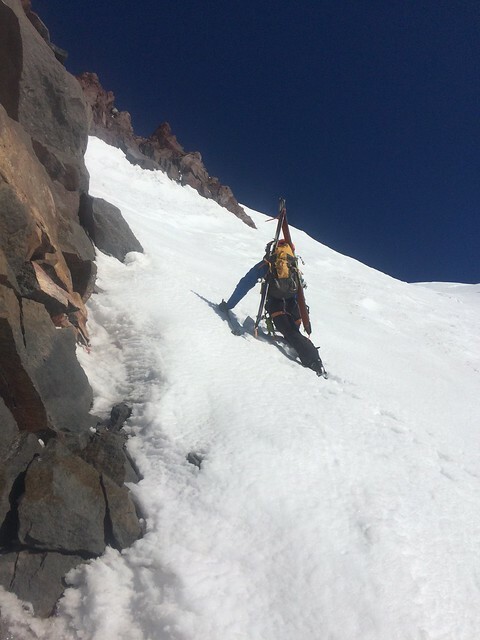 We trended climber’s right and at about 6,900 ft (10:45) passed through a notch between two rocks. At this point, exposure from cliffs above the lower face decreased. We took a deep breath and established a rhythm as snow firmness increased with elevation gain. It’s worth noting that this section of the climb is steeper and receives less early morning sun this time of year. The breeze picked up as well. Tim set a g-o-r-geous boot pack in firm conditions on the upper face. I wished I had a second ice tool. 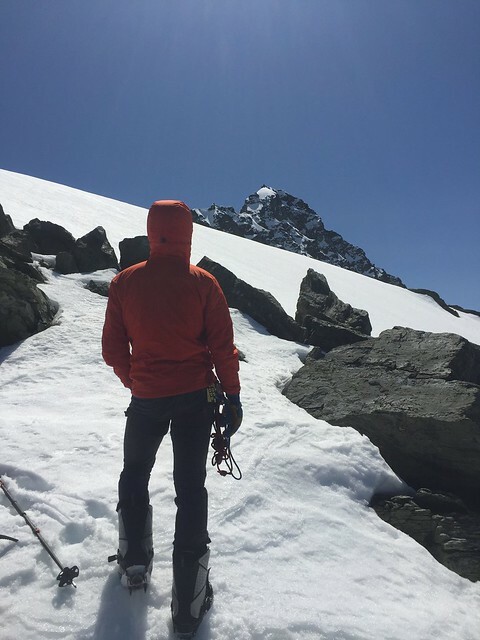 The rock that borders the top of the climb make an excellent lunch perch, with astounding views to Price Lake and the valley below… Not to mention the summit pyramid of Shuksan. When we left the car that morning, we weren’t planning to ski back down the NF. Needless to say, the climb hadn’t changed our minds. We had two (reasonable) options from here. 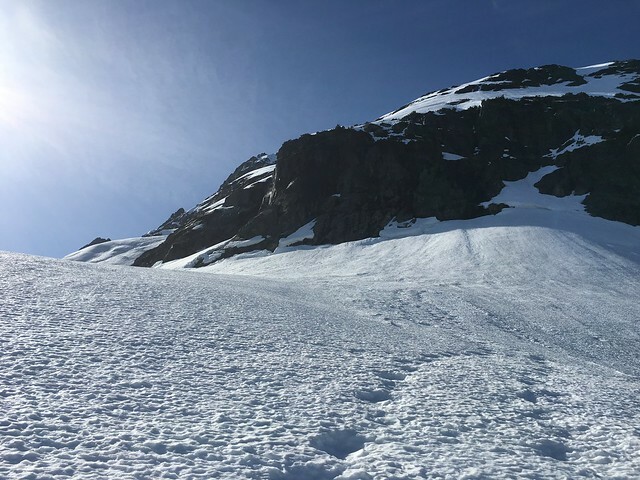 Circumnavigate the summit pyramid (and possibly summit) or take the Hanging Glacier to the White Salmon (via the Upper Curtis). The decision was postponed until we toured up to the saddle SE of our resting place. From here, we were able to see the upper reaches of the HG to our west and the Crystal to our south. A quick look at the time and the smooth corn to the west, and we made the easy decision to save the summit for another day. In retrospect, this was a fantastic choice. Perfect corn down the HG to the Upper Curtis. We were cautious for several reasons, the most obvious being cracks. 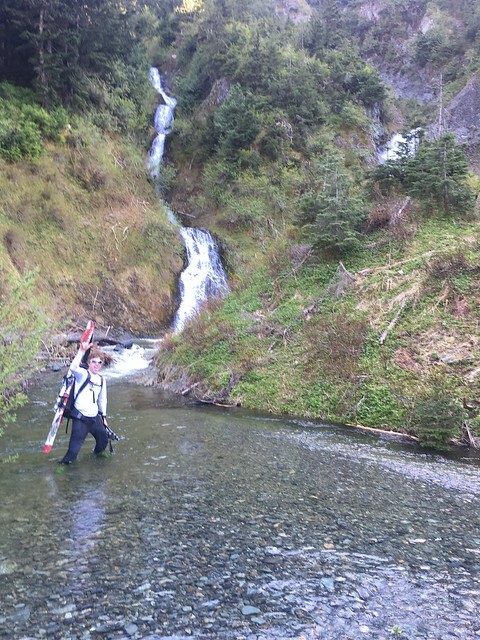 We also didn’t want to miss the entrance to the White Salmon, somewhere to skier’s right. As we approached the ridge separating the Curtis from the White Salmon, Tim wondered if we could tour up along the Arm. Anybody know if that’s a viable route? Our last few cuts on the Upper Curtis were a turning point in the tour. All of a sudden, loose wet became a major concern. 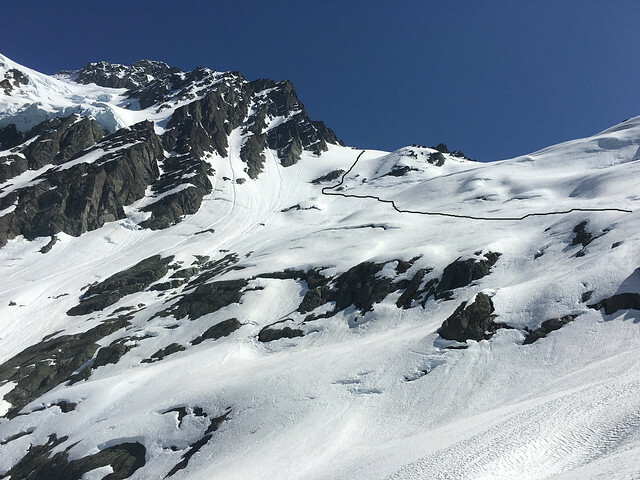 Hot pow cut from our tracks slid slowly down the steep glacier. At the top of the White Salmon, the snow is less exposed to the sun. We evaluated the terrain and plotted a route down. 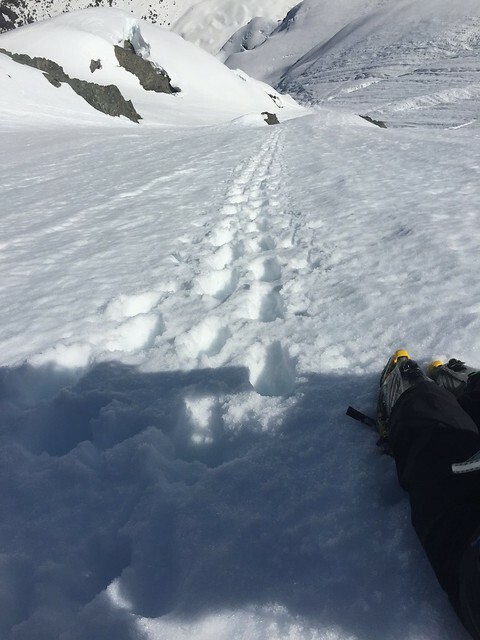 The first 500 feet were consumed boarding fall line on quality corn. There are many roll-overs, we paused atop each to avoid boxing ourselves in. The temperature increased dramatically and snow quality suffered. The remainder of the descent was spent minimizing exposure to wet loose. We traversed left across the slope toward mellower terrain, cliffs below. Nothing major released, though some slow movers plodded away. The Arm wasn’t on our list. It was hot on the way in. We knew it was a dead end on the way out. We generated a mental map of the valley, noting where we’d break up through the trees toward Chair 8. It looked close, doable in an hour. We were close, maybe 200 yards from the clear cut. The alder was thick, and we’d been up and down the creek looking for a place to cross. We back tracked to the pool below the waterfall and charged in. Drained boots on the far side, wrung out socks and swore never to admit the alder had been as bad if not worse than David claimed it would be. One of Tim’s many great qualities is his ability to buy in, to validate the reality and cultivate an attitude that gets you through to the other side. Coming out of the valley was tough. Tim wrestled his way up steep slopes through the trees and brush. I tagged along. There’s not much to say about this section. Not much advice to give. I guess do it early in the season, or don’t do it at all, or just do. When we finally squeezed through the brush onto the gravel road below Chair 8, we were a thousand steps from dry feet and a big gulp of water. Amen. We arrived at the car triumphant, having just passed a nice couple on their way to a sunset picnic. Bags hit the pavement, I threw my ski boots off and started digging for the vest that held my keys. When I saw all 3 zippers gaping, I knew immediately. The keys were gone. All the times I’d thrown that thing around flashed before my eyes. For all I knew, they were sitting at the top of the North Face. Bye bye big gulp. Bye bye dry shoes. We were stuck. Eli, Tim’s brother came to the rescue. After mere seconds of pleading, he agreed to drive out to pick us up. He even grabbed a spare set of car keys from my beloved housemate, Evan. Tim and I killed the time doing laps up to White Salmon Lodge to stay warm. We ate palm fulls of crushed ritz crackers and begged water from kind motorists. By the time Eli arrived, I was fading in and out of cold sleep on the pavement. Tim was whistling to himself, mumbling about northern lights. This one has been in the works for a month or two but this last weekend we finally got our schedules to line up with a weather window so the Fuhrer Finger was a go. Chris and Colby drove in from Utah on Friday and camped out, so Sam and I met them in the Paradise parking lot Saturday morning around 9:00 am. We spent a couple hours arguing over gear and drinking beers at the car before finally setting out around 11:00 am. 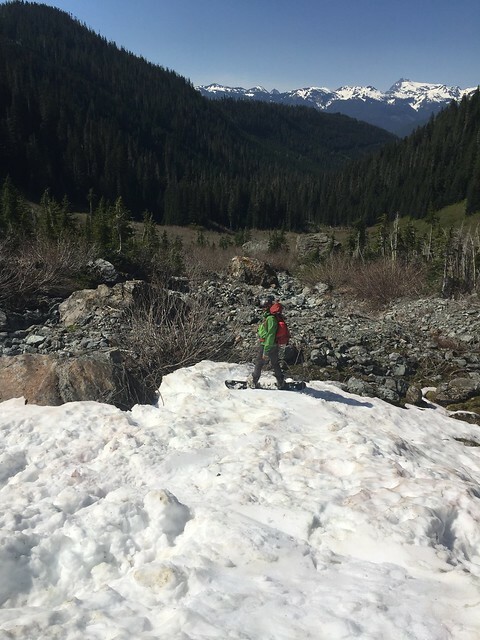 A skin up to Glacier Vista and a ski down the other side of the moraine put us on the lower Nisqually Glacier where we crossed with out roping up seeing no evidence of anything that opened yet this season. Of greater concern was rock fall and wet slides in which we saw increasingly as the temperatures climbed toward the 51° high for the day. 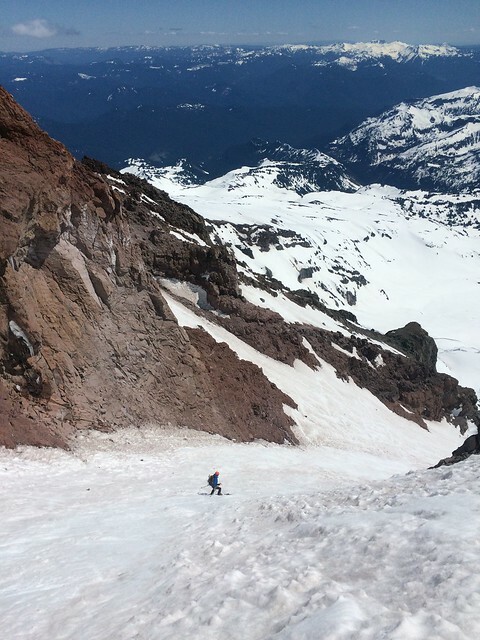 On the other side of the Nisqually we ascended to the Wilson Glacier up a chute know as the Fan. At this point wet slides were a real prospect and we saw several trigger as skiers rode down from their high camps. 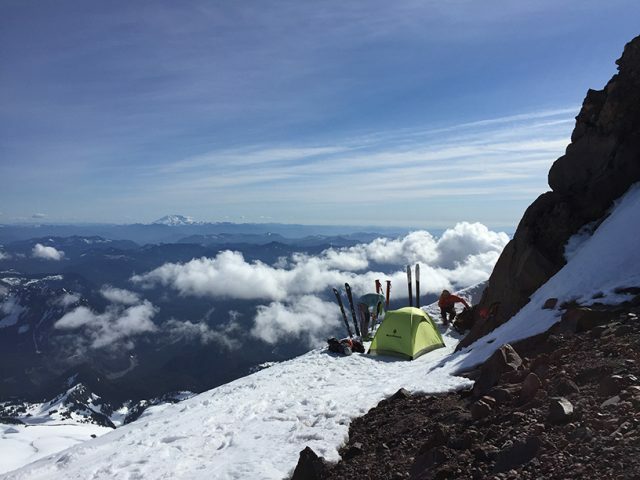 We reached the ridge at 7800 ft and followed it up to 9000 ft where we made camp for the evening around 4:30 pm. As the sun went down the wind picked up and really whipped around so by the time the alarm went off at 2:30 am it was just as well, we weren’t sleeping much anyways. 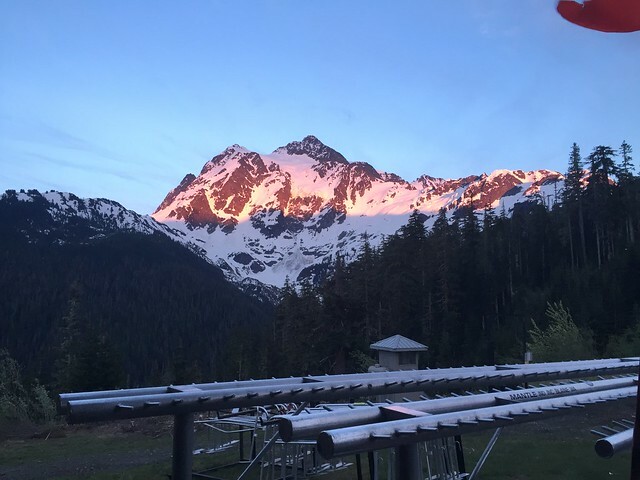 From the tent we could see the headlamps of several teams making their way up the lower Wilson toward us, in what was likely a single day push for the summit. 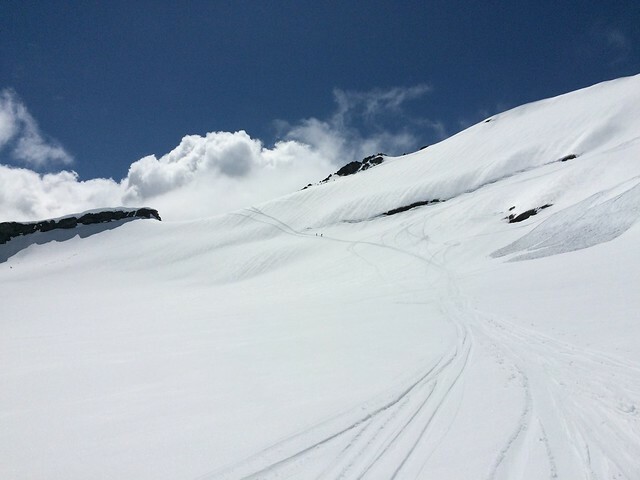 We wrestled with our gear and fought to stay warm before shouldering our boards and skis, roping up and setting off. This was pretty straight forward although there was a massive debris pile to cross and a few big cracks to side step but then we arrived at the base of the finger. 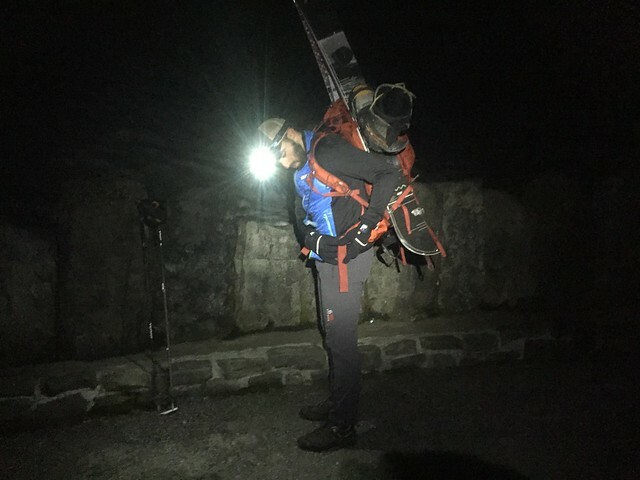 There were a few teams already in it at various stages of their climbs so we unroped to travel easier, switchbacking until it was too steep and front pointing became the only option. At the top of the finger we were almost forced to stay left onto the ridge as the upper Nisqually is so broken up at this point in the season, trying to navigate it would be a headache. 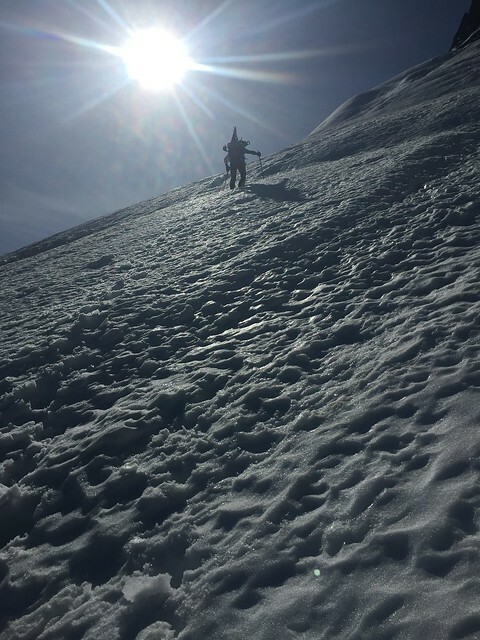 The ridge is much steeper however and provides the crux of the route on both the ascent and descent, a 50°+ pitch around 12200 ft where a fall would have harmful implications. 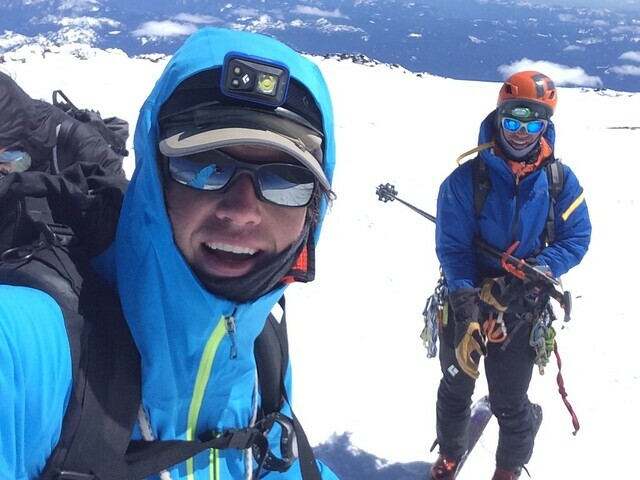 At 13,400 ft we roped up for the final time and made our push to the summit on skins. 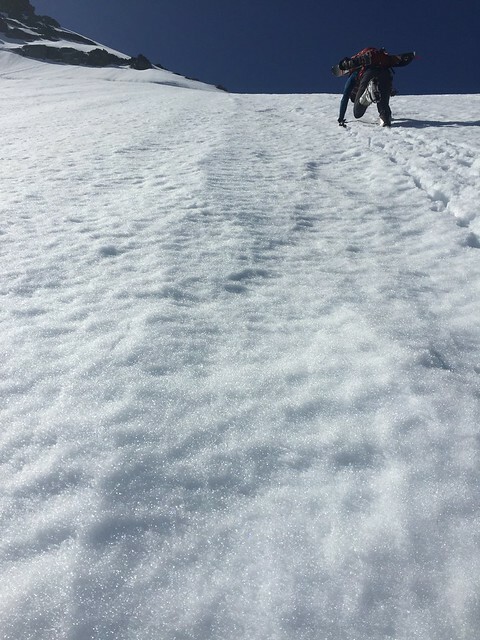 The splitboard on the feet proved to be crucial when at 14,000 ft the snow bridge I was crossing collapsed leaving me suspended over the void with just the tip of my split hanging onto the up hill side of the crack and my tail on the other side. Good prevailed in the end though and we topped out around 1:00 pm. The weather on the summit was warm and if it hadn’t been for a strong breeze blowing around, tank tops would have been appropriate attire. As it was we were already a few hours behind our anticipated schedule so we hurried down. The top 2000 ft of turns left much to be desired, retracing our climbing route as we rode down. Around 12400 ft the snow was beginning to warm, making the crux on the ridge just bearable (though we did see one guy down climbing it). 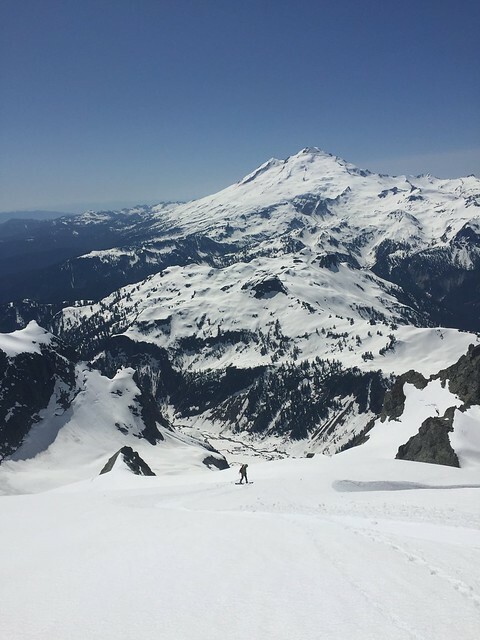 By the time we got to the top of the finger the snow was perfect leaving us with 2500 ft of spring time riding down the Fuhrer Finger, on the tallest volcano in the lower 48. Back at camp we packed up and headed out ready to get back to the car. We enjoyed another 1600 ft of good turning before the snow quality deteriorated completely and turned to slop. A happy first ride off the top of Rainier. Let’s not wait so long to do it again!